BLISS ON THE CASE INLET! ROW INTO THE SUNSET, WALK THE BEACH & SOOTHE THE SOUL! Our 1st class beachfront nest w/Olympic Mt. views is private slice of heaven! Wake up in the master bedroom suite to a magnificent view of the Case Inlet and the Olympic Mountains! The queen sized bed is pillow topped with luxurious high count, 100% cotton sheets. The living room possesses a fully stocked kitchen with all amenities and some gourmet extras including a waffle maker, coffee grinder (with some delicious coffee supplied), toaster and a blender. The queen sized pull out bed faces the view as well as the electric fireplace and media center with WIFI. The flat screen TV (with college and NFL channels), a DVD player and a Roku (with complimentary Netflix). We also have some games, cards and a library for your pleasure, choose a book and if you have not reached the ending by your departure, take it with you! Compliments of Breezy Hideaway. Available as well are thick sleeping pads for extra guests and / or for camping. We may only sleep 6 in the winter, but in summer we up that number to 10 as 2 can sleep in the cabana and 2 more in a tent! We haven't purchased the tent, yet so bring your own.Just outside your door is a table that seats 4 to 6 for meals made on a gas grill or in your state of the art kitchen. The patio is large with lounge chairs, an out door heater and several seating areas. A beautiful private pathway that leads down to your hideaway from the parking area. A lushly landscaped pebbled path meanders down to the beach and a fire pit on the bulkhead. There are many private nooks for relaxing, or to sleep under to stars. Enjoy a fire in the pit, roast marshmallows or swing in the hammock and watch the sunset over the water. Walk for miles on Case Inlet's most pristine beach, dig clams and oysters or go for a row in 1 of our kayaks or the canoe. Buying a shellfish licence is a good idea, no one has been stopped yet but you never know! Sleep in the unit or on the bulkhead in the cabana, May through Sept, weather permitting! Pitch a tent above the beach or on the lawn! Only property on the South Puget Sound with beachfront and an in ground private pool! Pool is open from mid May to mid September. Owners Yaponcha and Deanne are available for any needs or questions you may have. The Hideaway is the lower level of the home. It has been structurally remodeled as to be completely separate from the main house. The rental will feature art from local artists and friends. Paintings are available for purchase. My husband and I met on the island of Guam, but we are both from the Bay Area. He was a tennis pro at a 5 star hotel and I was in the tourist industry. I cut my foot while swimming in the hotel pool, he bandaged me up and the rest is history! We moved to the Pacific Northwest because I went to college here and still had some close friends in Seattle. We also both loved the rugged beauty of this area and wanted to raise our son here. It was a wise move. Yaponcha found work in the construction supply industry, I became a paraeducator in Special Education and our son, Atlee, grew and thrived. Why? I would have to say because we have been blessed with this bliss and we want to share it! Breezy was my mother and we inherited this 2 acre slice of heaven from her and my father. Shoulders drop and grins abound upon arriving at the Hideaway! As you drive down the driveway the woods open up and you see the pool, the house with it's lovely gardens, South Puget Sound and the Olympic Mountains. The photos can not convey that feeling of joy everyone gets upon arrival! As far as we know Breezy Hideaway is the only South Puget Sound waterfront property with a private pool for rent. But the uniqueness of Breezy Hideaway goes so much further than a mere swimming pool! This property hosts 6 levels of manicured gardens and patios, each with cozy spots to relax. Many guests say the photos do not do it justice, although we had them done professionally, they don't convey the overwhelming magnificence of all the vistas above Puget Sound. Sunsets at Breezy's, everyday, every season are breathtaking and almost spiritual! We didn't choose this property, it chose us and everyday we thank Breezy and Dad for this gift! It give us so much joy to share it, just to see our guests unwind and their shoulders drop is a true blessing! His & hers vanities with a separate tub & shower with a tile surround. 100% cotton towels are provided as well as beach towels. We supply soap, shampoo and conditioner. We also provide a hair dryer, razors, extra brushes and toothpaste, makeup remover, q tips and a variety of soaps. 20 minutes to Gig Harbor for excellent restaurants, farmers markets, and art galleries. Down town is quaint with great antiquing, shops, and marinas. 40 minutes to the ferry for the Sea Hawk Stadium. Breezy Hideaway is on the Puget Sound's Case Inlet. Our home has a resort like atmosphere with the beach and the pool all inclusive, but without any other guests! The home is tucked away in a secluded wooded area on the case inlet. Going down the driveway, the view opens to paradise! There are trails through the woods and country roads for walking/biking. Near by town of Key Center sports a wine bar, expresso stand, market, post office, and tavern with music on week ends. Can relax on the patio or bulkhead and have an excellent view of the cove and the rest of Case Inlet. Includes two acres of landscaping, forest, beach, and lawn. Beach is located on the case inlet, pebble beach with some areas of sand. Views include the Olympic Mountains, Stretch Island, Harstein Island, and Heron Island. Enjoy a pristine view of the Olympic Mountains from practically anywhere on the property. Yes, you can water ski in and out! Experience panoramic water views from all areas of the home, and some of the most exquisite sunsets. We have a boat launch less then 5 minutes from the house for those who would like to bring their boat.. Canoe and Kayaks are available. Please bring life vests for children. We have adults jackets. Heat pump, space heater and fireplace. We pride ourselves on using high quality lines as we are big on comfort. We also have many pillow and extra blankets to choose from as well as throws for by the fire. There is no washer or dryer in the unit, but I do guest's laundry upstairs with no charge! Your parking is a short walk to the beach gravel path for your rental. Bath, beach towels and 2 doogie towels! Freezer included with ice trays. Inside you'll find condiments such as fresh cube of butter, mayo, catsup, hot sauce, mustard & soy sauce. Full spice rack. Bold roast coffee, an assortment of teas, creamer and a wide range of sweeteners are also on hand. Balsamic vinegar, olive oil, soy, A1, mayo,catsup, and mustard hot sauce & popcorn. Full kitchen, with all amenities, cookware, waffle iron and blender.We stock bold roast coffee & teas, virgin olive oil, balsamic vinegar, pancake mix, pure maple syrup & a wide range of spices. Extra chairs available to seat 6 Outside dining areas on upper and lower patios available. Extra chairs available for larger groups. We have a nice variety of books and games available for your enjoyment. And if you haven't finished you book choice, please take it home with you! Some games available, as well as games on dish network.We have Bananas, cards, UNO, back gammon and a chess set. Large lawn and gardens at the upper level of the property. Balconies overlooking the beach on the bulkhead with seating areas, a cabana and a hammock (summer).Also a balcony on by the fire pit as well as a full view from your patio and every room in the unit. Both available on site. 2 kayaks and a canoe. Some adult lifejackets and other pool floats and toys. We also have 2 crab pots for our guests to use. 2 kayaks and a canoe. 15 minutes to nearest golf courses. We can make reservations for you previous to your arrival. There are stairs on the property as well as pathways. The stairs have railings and can be used to get to the unit instead of the private path (which is pebbled with a few steps but no railings). 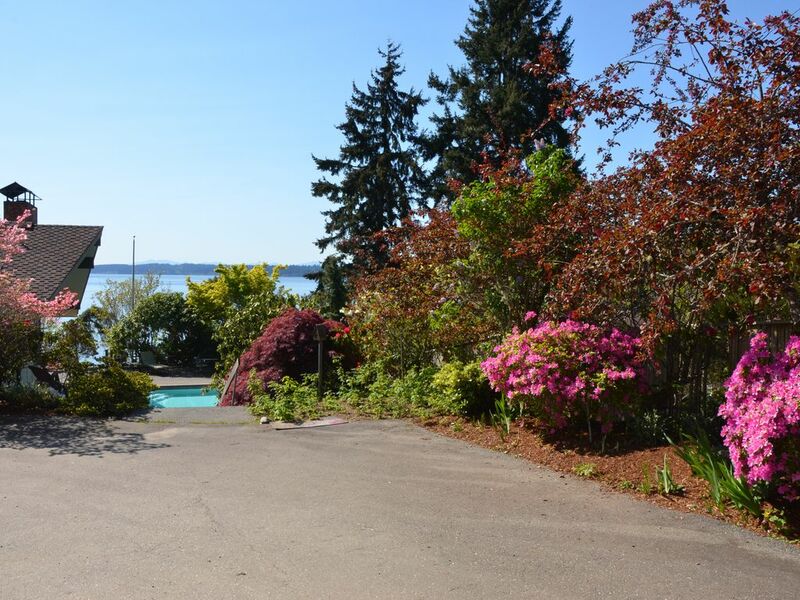 Only property on So Puget Sound with a pool & the beach! Private pool ,12ft. deep end, heated between May 20th- Sept. 20. Pool is between 80 - 85 degrees. Some floats, pool toys & adult life jackets. Breezy Hideaway is a serene water front property. It is a family (and dog) friendly slice of heaven! We will even do your laundry - no extra cost! Whether you choose to walk for miles on our pristine beach, dig for clams, fly fish in the cove, go for a paddle or spend your day by the pool, tranquility will claim you! Spend your evenings at the fire pit, in the pool or relax in the hammock over the beach. Spend a summer night in the cabana and wake up to the glory or the Puget Sound, with the snow capped Olympics in the distance! Breezy has 5 levels of view property, all landscaped and with cozy spots to lounge or pitch a tent. Gig Harbor is a great spot for family or fine dining, music or a movie and is just a 15 minute drive. Seattle is a 45 minute (depending on traffic) drive or a ferry boat ride away. Take in a Seahawks, Mariners or a Sounders game or visit many of Seattle's major attractions; Pike Place Market, The EMP, the Woodland Park Zoo, the Glass Museum and many more! This was a great little get away, beautiful views, welcoming owners, very private and nice accommodations. We would like to go back! Amazing view, was a little sad that the cabana wasn’t set up, but I wasn’t sure if that was a summer time only thing. Kayaking was the best! We saw jellyfish, starfish, crabs, a seal and all sorts of birds. Nice cozy firepit and excellent outdoor areas. The entire property in and out is excellently maintained and very comfortable. So close to Tacoma and surrounding areas, a truly beautiful place to enjoy a getaway with everything you need already there. Could not have said it any better myself! We do try to make everything the way we would want it. Thank you and hope you return. Don't forget to send me a message so I can give you the returning guest discount! And please post some pictures on Breezy Hideaway's FB page! Beautiful inside and out-fresh oysters on beach nearby and all the accompaniments inside pantry. Wowsie and more. The place was perfectly set up for everything. We kayaked, canoed, had a campfire, hiked down beach for oysters. What an amazing place to stay. That is a gem of a review and I love the drawing and note you left in the journal! Hopefully we will will see your family again. Come in the summer so you get the full experience of Breezy Hideaway, pool, cabana and lots more shellfish! Book early and let us know that it's you and we will give you a discount!Thank you for spending Christmas with us! That was quite an honor! Very clean, well furnished, cozy spot for exploring and relaxing! We are so glad we chose Breezy Hideaway. The proprietor was very attentive to our needs and the space was perfect for us for a 4 night get away. The views of the Sound and the Olympics were to die for. Very quiet and serene. We even braved the cold and had a very nice fire in the fire pit one evening. We were glad we made the trip and will plan to return in the not too distant future. We appreciate your grand review. They are the life blood to this endeavor! And It was absolutely gorgeous the days you were here, bright, crisp clear, and freezing! Don't forget we give a returning guest discount, so don't instant book. Please send an inquiry. Thank you so much for choosing Breezy Hideaway! No matter your lifestyle this comfortable home has activities to suit your needs. You can spend your days relaxing by the pool, digging fresh (and delicious) clams at the beach, exploring of the several local coves and nature sanctuaries, or enjoying the city life of the neighboring towns. Hop a ferry for Seattle and your within walking distance of Safeco Field for a Mariners game, Century Link to see the Sea Hawks play your favorite team,Pike Place Market and all of downtown. While beach combing, go Northinto the beautiful Dutchers Cove, which is easily accessible at low tide on foot or high tide by kayak or canoe. The Haley property is a state park located about a 1/4 mile South of the rental. This area has trails, a long beach with oysters and clams, and a bird sanctuary in the cove. The Haley Property is only accessible by foot or boat, so it almost always has low foot traffic and can be the perfect place for a relaxing day. You can enjoy the local farmers markets and beautiful state parks only minutes drive from the home. Penrose Park, Joemma Beach Park, and Vaughn Bay offer great beach combing, miles of trails for hiking and biking. For those who wish to go out into the cities, Gig Harbor has a bustling uptown with several new boutiques and a state of the art new movie theater. Fine dining can be found in both uptown and downtown Gig Harbor, with food to fit any taste. Downtown Gig Harbor is a very walkable town with art shops, several parks, and occasional outdoor festivities and concerts. Farther West along Highway 16, Tacoma carries its own attractions. We love the Museum of Glass, which is part of Tacoma's Museum District. It is also home to great restaurants, including some of our personal favorites, Asado and The Pacific Grill. Experience the local attractions of Tacoma, i.e. Chambers Bay (home of the 2015 US Open)and the Point Defiance Zoo. Park at the Amtrack station and ride to Seattle for a Sea Hawk game, watch the Seattle Sounders or the Mariners! Of course, Seattle itself must be mentioned. Only an hour drive or ferry from Breezy Hideaway, it harbors all the excitement of any large city around the nation. It is home to the world famous Pike Place Market, as well as a very exciting downtown with it's fine dining, concerts and plays at the Paramount, the Neptune or the Moore theaters. Ride the Monorail, the trolley or a horse draw carriage if your don't feel like waking. We have no long term rental, we cannot book a stay for longer than 29 days. Rates are subject to change until reservation is confirmed.